Western blot analysis of extracts from HCC827 and H3255 cells using EGF Receptor (L858R Mutant Specific) (43B2) Rabbit mAb (Biotinylated) and detected with Strepavidin-HRP #3999. 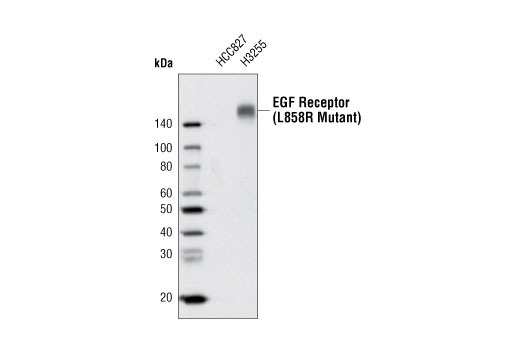 EGFR (L858R Mutant Specific) (43B2) Rabbit mAb (Biotinylated) detects endogenous levels of EGFR mutant L858R protein. The antibody may cross-react with wildtype EGFR and other HER family members when highly over-expressed. Careful titration of this antibody may be required to obtain optimal specificity. This Cell Signaling Technology antibody is conjugated to biotin under optimal conditions. The biotinylated antibody is expected to exhibit the same species cross-reactivity as the unconjugated EGFR (L858R Mutant Specific) (43B2) Rabbit mAb #3197.